Smoothies are a great way to get a dose of fruit, fiber and good fats. This shake is loaded with antioxidants and full of flavor. Adding a little canola oil to it provides omega-3 fats and vitamin E as well as a smoother taste. Every body wins with canola oil! 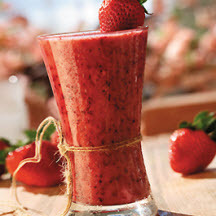 In a blender, add banana, blueberries, strawberries, green tea, cranberry juice, ice cubes and canola oil. Blend until combined. Serve immediately. Tip: Use fresh or frozen fruit. Your favorite cold tea may be substituted for green tea. Nutritional Information Per Serving (1/4 of recipe; 1/2 cup): Calories: 120; Total Fat: 7g; Saturated Fat: 1g; Cholesterol: 0mg; Total Carbs: 15g; Fiber: 2g; Protein: 1g; Sodium: 0mg.